Anyone can claim that something is going to be a trend. People predict trends based on numerous factors, both research based and non-research based. There are sites all over the interwebs listing trends for Spring 2009 weddings and I'm going to round up what I feel are the best of the best. 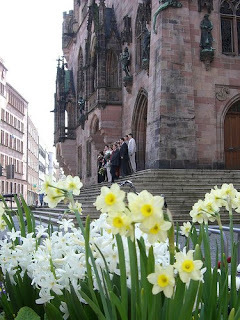 Small luxurious weddings: a no-brainer here, really. We may be in a recession, but that doesn't mean people aren't still getting married! They are just doing it with less guests to trim costs since the average [American] wedding budget is down over 33% from 2007. Less guests means more intimacy and more creative license to really get the details you are lusting after without the price tag that comes attached to your 150 count guestlist. Empire Waist Goddess Gowns: how gorgeous and effortlessly elegant is this gown? an empire waist dress will flatter many different figures. you can show your collarbone and shoulders and camouflage flaws underneath the full bodice. very feminine and super-appropriate for Spring! Black Flowers and Accessories: well, maybe not black flowers, that is a little too Goth for a Springtime wedding, but definitely black accessories! 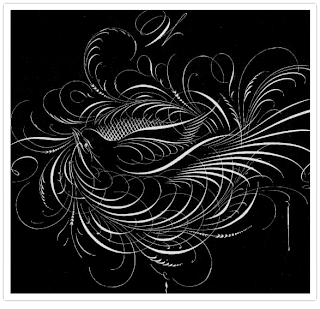 I'm thinking black table runners, black chargers, black vases or black calligraphic accents on the menu like the one above. 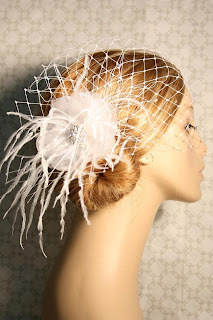 Vintage Fashion and Fascinators: Etsy is all the rage, especially with hip, in-the-know brides [there is so much Etsy love out there it's crazy!]. Etsy is an Ebay-like marketplace for people all over the world to buy and sell handmade goods. There are so many amazing pieces on Etsy for fashion forward [or backward? we are talking vintage here] brides-to-be. Combs, flowers, fascinators, birdcages, pillbox hats... the list goes on. Unique, one-of-a-kind items that are instant heirloom pieces are what's in for Spring. Do you agree? What do you think the biggest trends are for weddings this season? 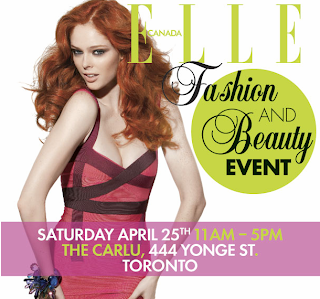 If you live in or around Toronto, the place to be on Saturday is The Carlu which will be playing host to the annual ELLE Fashion and Beauty Event. The ELLE Show will feature clinics and seminars boasting the colors, tips and trends for the upcoming spring/summer season. Lunch and a gift bag are included with price of admission. The daytime event will run from 10:30am to 5:oopm. Tickets are $35 and can be purchased here. The evening is a benefit/fundraiser for the Toronto Fashion Incubator, a non-profit organization dedicated to supporting and nurturing young business entrepreneurs. Guests have the opportunity of purchasing V.I.P. Cocktail/Dinner/Silent Auction & Show tickets [$255] or General Admission Cocktail/Silent Auction & Show tickets [$55]. The evening is dedicated to the Toronto Fashion Incubator New Labels Competition. After a rigorous six-month design competition, the runway show will unveil the four finalists from the competition: Faren, Jody Leigh, Gushueswim and Thieves, as they compete for an ELLE Canada prize package valued at over $25,000. Anne-Marie Mediwake of Global News will be the event emcee. Will you be attending the ELLE show?